Sunny Visit to St Fagans Museum! As the day went on, we were very lucky to meet many people, and our room was constantly buzzing. Our team members had some great and detailed conversations, and we heard about experiences of childbirth, postcode lotteries, cancer treatment, work, life, and loss. These personal, reflexive, intense encounters were invaluable to our team, helping us to better understand how people think and feel about the NHS, historically and personally. These conversations remind us that when we write history we document something very meaningful – we are writing about people’s lives, as well as recording the entwined shifts in medical inventions, categories, and institutions. In addition to having great conversations on the day, our team were also left with a variety of writings and drawings to reflect on. The sketches on our nurses’ uniforms were particularly interesting. Many visitors to the Museum were initially reluctant to draw on them as they sat, pristine, in the centre of our room. As time went on, and people talked to our team, they were emboldened to write political messages: ‘No Paycap’, ‘Divided we fall and United we stand’, and ‘KEEP IT FREE’. 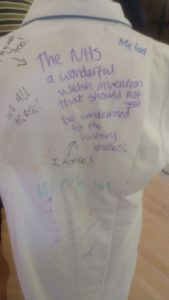 Some people asked our permission before writing on the uniforms, checking whether our historical project would be happy to hear ‘political messages’, whilst others shyly and quickly wrote their messages, more in the clandestine manner of graffiti. One woman who we met had worked as a nurse in the 1970s and 80s, and told us that these were not ‘proper uniforms’ but rather ‘overalls’, because proper uniforms involve caps and capes. This is a perception which we encounter regularly at our events, and which is informing the work of my colleague, Natalie Jones, as she plans an art piece around nursing attire. 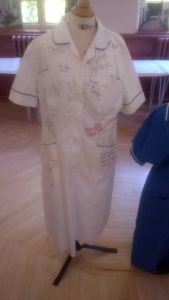 This former nurse also told us that writing on uniforms had a long historical precedent: when she worked in the NHS, nurses’ would write reminders on the underside of their aprons. This was a fascinating piece of knowledge which we had not encountered in the archives, but which imbues added meaning to our thinking on the everyday practices of nursing, as well as artwork with the uniforms today. Children, also, drew for us on both nurses’ uniforms and our long sheet of paper. Older children drew equipment which they would expect to see associated with nursing work today – scissors, pens, syringes. 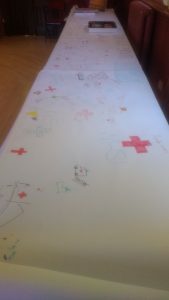 Younger children, when pressed about how to ‘draw the NHS’, tended to move towards visualising helicopters and ambulances (interestingly also the most popular theme to draw at our event with child patients at University Hospitals Coventry and Warwickshire). 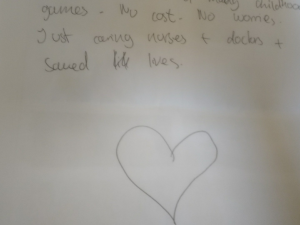 Some children’s drawings also revealed a level of commitment to, or even love for, the NHS. We saw for example a picture of Spiderman, ‘because the NHS is a superhero’. These images help us in our thinking about when children start to learn about the NHS. 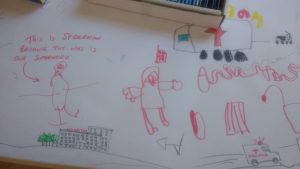 We are also developing a picture of how children’s understandings of the NHS are formed –through exposure to news, and contact with parents, other children, teachers, and the Service itself. Following the event, we were also left with 64 filled-out surveys of various types. Looking through these, many interesting themes emerge. For myself, researching campaigning and activism, I was really struck by the fervency with which teenage respondents spoke about the NHS in these materials. These responses, and more, help us to think about national differences in the NHS. These differences emerge in terms of the politics of the Service, its practice and provision, and also culturally –with the figure of Nye Bevan a regular theme for our survey respondents. Overall, our team learnt a lot from this event, and still have much to reflect on. 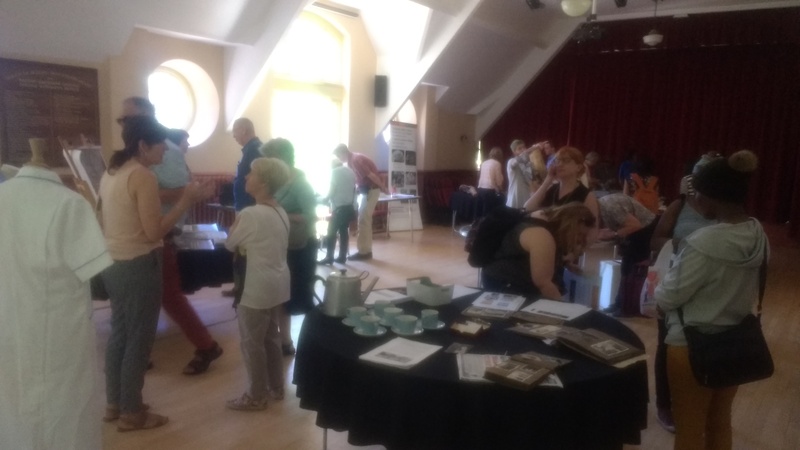 We are very grateful to the team at St Fagans for working on this with us, and, as ever, incredibly thankful to the people who come to our events to share their stories and reflections. We are very privileged to hear these stories, as we try to collaboratively put together a ‘People’s History’. Having now worked on this project for 18 months, and run over 30 events, meeting many people, our team are starting to gather a fascinating mass of information. Our next challenge is working out how best to bring this material together, in a manner which respects and utilises the testimonies which we have collected. We have public testimony in a variety of formats – several surveys (virtual and paper), recordings, conversations, website contributions, tweets. These materials discuss different locations, periods of time, and life experiences. In the months ahead, we hope to draw together a range of books, journal articles, and pieces for popular press. These will use this range of materials, along with archival work, to reflect on how the NHS has changed over time, and what it has truly meant to people’s lives. We very much welcome further contributions at our upcoming events, by email to NHSEngage@warwick.ac.uk, or through our website.